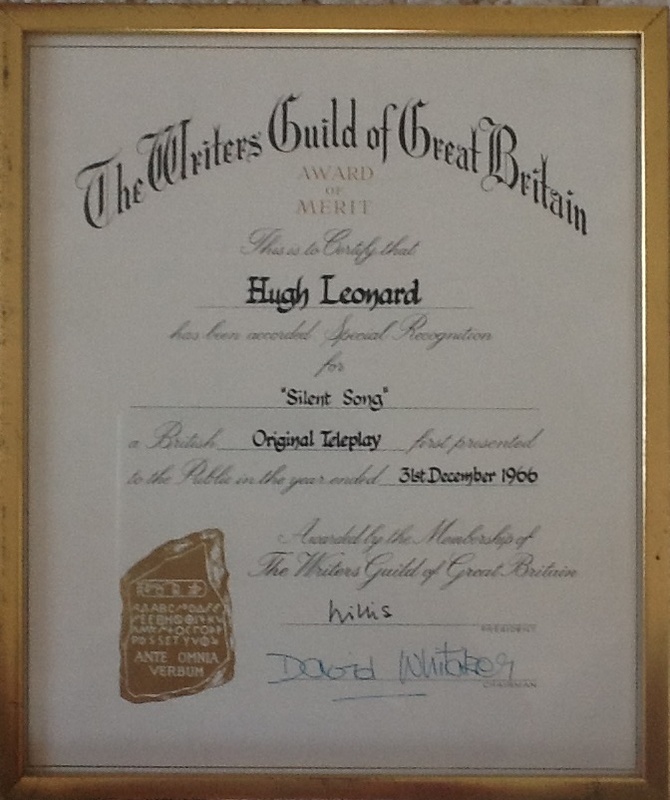 Mick and Mick, Hugh Leonard’s play of 1966, provides a good example of the difficulties of cataloguing his work. In Mick and Mick Fran Corish returns home to Ireland after eight years in England and discovers that, emotionally, she never left home at all (“I never left them… all the nice people”) and tries to face up to hard choices (“A choice between Micks is no choice at all, Fran”). 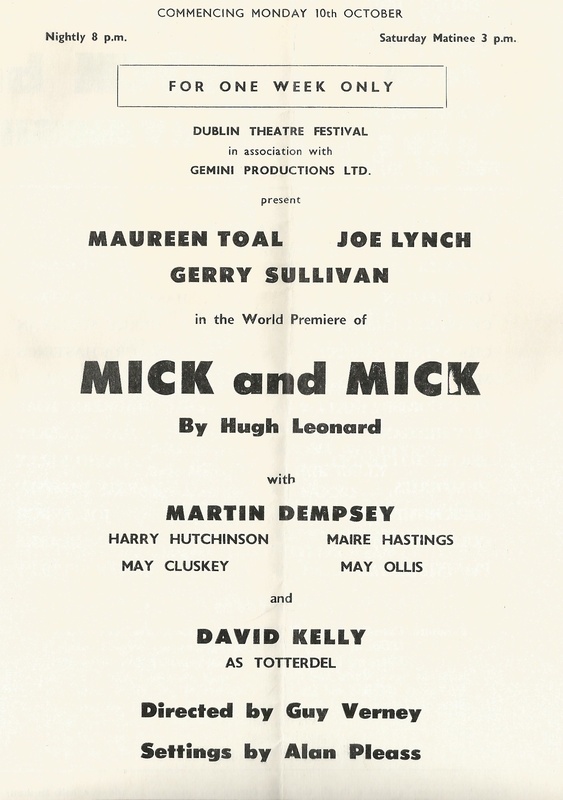 The play was staged in the Dublin Theatre Festival in October 1966 – the programme for that production is illustrated here. But a version of the same play with the same cast and the same director, Guy Verney, had already been produced for television’s Armchair Theatre in August 1966 as Great Big Blonde. This is misquoted in some sources as “The Big Blonde”. And to cap it all in 1976 the stage play was produced at Olney Maryland as “All the Nice People”. This is not an isolated instance. John Keyes Byrne wrote A Nightingale in the Branches but it was as Hugh Leonard that he submitted the same play as The Big Birthday to the Abbey Theatre in 1956. Irishmen (Olney 1975) and Suburb of Babylon (Dublin Theatre Festival 1983) have surely both been used to present the same trilogy of one act plays. And so the disentangling continues and the “Compleat Hugh Leonard” remains, for now, a work in progress. The best effort will be posted to the Links and Resources page of this site. The large cast and good cameo parts means that Mick and Mick remains popular especially with community theatre companies. It has been presented in 2012 by Square One Theatre group in Bray, who have lent the image used here. Maureen Toal who died in 2012 was the original Great Big Blonde of TV and stage. She appeared in many HL plays in the 1960s – and in the original production of A Life and Pizzazz. Suburb of Babylon is being presented at the Ilkley Playhouse in April 2013. Individual plays from this trilogy are regularly staged.